This combined degree is a Bachelor of Arts with a major in human services and social justice and Master's of Public Administration. All requirements for the Bachelor of Arts in the field of human services and social justice and for the Master's of Public Administration are to be completed. PPPA 6000 is not counted toward the BA requirement. PPPA 6001 6002 6003 6005 are double-counted toward the BA and MPA. PPPA 6004 6006 6009 are taken in the student's final year of study. 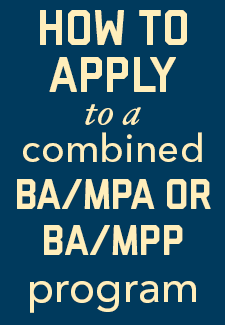 Students choose from MPA concentrations. Students cannot take more than half their credits at the graduate level in any semester during which they are undergraduates. Assuming students have not transferred any credits into GW, application to the graduate portion of the program occurs during the sixth semester (at completion of 75 credit hours, 45 of which have been completed at GW). Students must be accepted for the graduate portion of the combined degree prior to the start of the seventh semester. It will be necessary for students to conform to the established requirements for completing an application. However, submitting GRE scores is optional and not required for combined degree students. Students should have a 3.50 GPA. Students with majors in the Elliott School of International Affairs are not eligible for this combined degree program. The handbook for the combined BA-MPA in Human Services and Social Justice contains additional details about the program.